As some of you may know, my fiancé, Jeremy Norton, was in a devastating car accident on December 3, 2016. His life and the lives of his loved ones were changed forever. Jeremy sustained C-3 and C-4 injuries, breaking his neck in two spots. He required surgery to put two screws and two plates in his neck. Jeremy now has very limited, uncontrolled movement in both arms and very little movement to his left ankle, thus requiring the use of a power wheelchair. Before his accident, Jeremy’s hobbies were gardening, working on his car, and woodworking. As a dedicated family man, he loves spending time with his fiancé, Allison, and their three-year-old son, Odin. Family and friends mean everything to Jeremy. Jeremy has received many rehabilitative therapies since his injury. He works very hard to further his recovery and continues his physical therapy for several hours each day. Jeremy currently has Medicaid, but this will not cover all the related expenses. 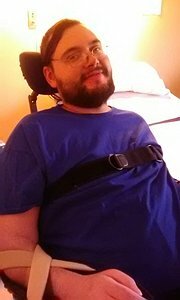 Before he can return home, Jeremy needs a hospital bed, roll-in shower chair, manual wheelchair, and wheelchair accessible vehicle, just to name a few. As you can imagine, the costs for such items are overwhelming. This presents a challenge that Jeremy and his family cannot meet alone. To help with the financial burden of uninsured expenses, a fundraising campaign in Jeremy’s honor has been established with Help Hope Live, a trusted nonprofit organization that has been providing community-based fundraising guidance to patients and their families for more than 30 years. All donations are tax-deductible to the full extent allowed by law, are held by Help Hope Live in the Southeast Spinal Cord Injury Fund, and are administered by Help Hope Live for injury-related expenses only. Please consider a contribution.